The Brass & Iron Foundry in now shipping. I make my kits in small weekly batches and ship them as they are completed. 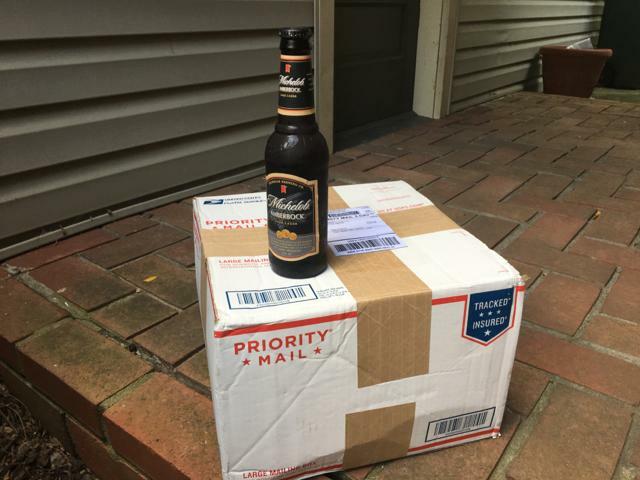 I know how anxious you are to receive your shipping notice, I would be too for sure! Kits are shipped in the order received. Keep in mind that on the initial day of sale so many people ordered that I am shipping by the minute ordered, not the hour or date. This means there are excited modelers who will be eagerly watching their email so please be considerate about making posts on all of the forums announcing you have received your shipping notice or kit. Remember that there are many other modelers still waiting! Ken Karns is presenting the official forum build and I am very excited to see Ken's personal touches applied to this kit. Ken is well known to many here and is such an awesome modeler and friend. Thank you Ken for undertaking this project and documenting your build. This takes a tremendous effort and we all appreciate it! Everyone is encouraged to participate in Ken's build thread. Please comment often and let Ken know you are here and enjoying his efforts but keep comments and questions on topic! Many folks visit the build threads for years to come following its conclusion and off topic conversations are very distracting. Note that this thread will be limited solely to Ken's build. If you would like to share your work on the SW forum (highly encouraged) please start a separate build thread. 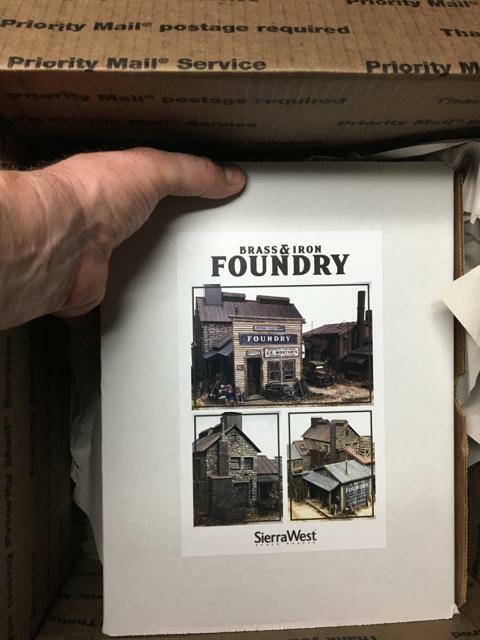 And thus it begins...we now embark on an epic adventure that will see us entwined within the wonderful elements of SierraWest Scale Models latest release THE FOUNDRY. I am honored and humbled to be presenting to you the official forum build of this amazing kit I now have in front of me. Brett has set the stage for a remarkable diorama that will take shape and evolve here on the forum. I would like to thank Brett for giving me the opportunity to build this amazing kit. It is obvious from the moment you open the box how special this release is and how much heart and soul Brett put into the research and manufacture of this kit...He has also proved once again that not only does he produce the finest craftsman kits on the planet, he's an elite and superb modeler who I have the highest admiration and respect for. Well done my friend! 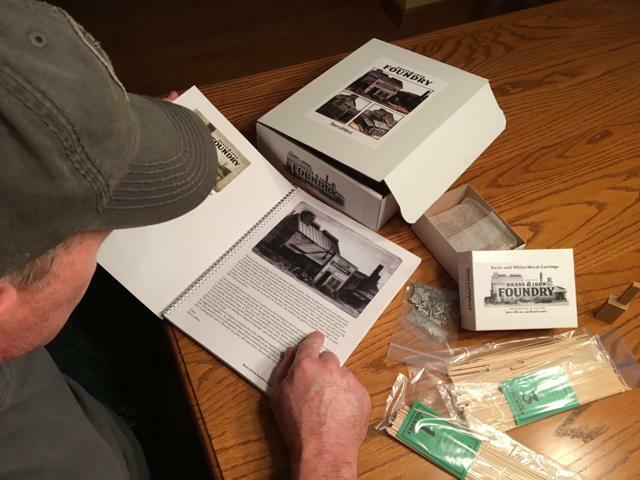 Brett will be providing a comprehensive unboxing video of THE FOUNDRY here on the web-site, so I decided an unpacking photo series would be appropriate...you can just feel the excitement! 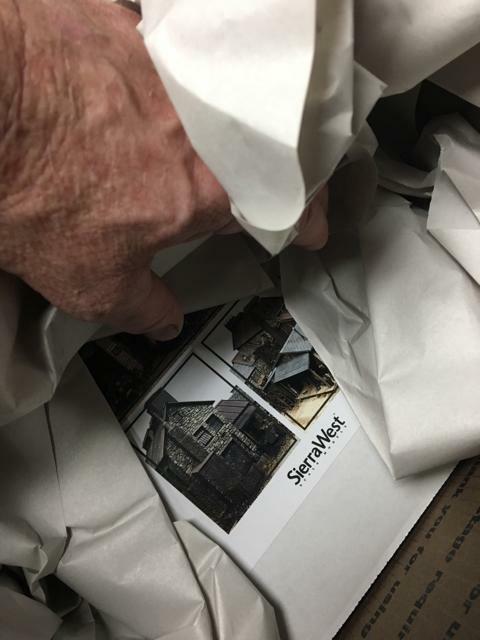 Beautiful color pictures adorn the box...first class and haven't even opened the thing yet. Step Number 1. As with all SierraWest kits, I begin Step 1 with a secure hold on Brett's unrivaled and renowned Construction Bible...I mean Manual...geesh I always do that...sorry. A initial cover to cover read is religiously performed and a plan of action is developed. Much of working up a SWSM kit for me is mental and this I provide ample time for. I cant wait to see your incredible work on this incredible kit Ken. I'm really looking forward to your interpretation and methods when building this kit, Ken. hot diggity dawg [rubbing hands together]! Very excited to be following along. Hoping to learn tons. Thanks for taking all the time required to do a build like this and post your progress. it really helps other modelers become that much better. 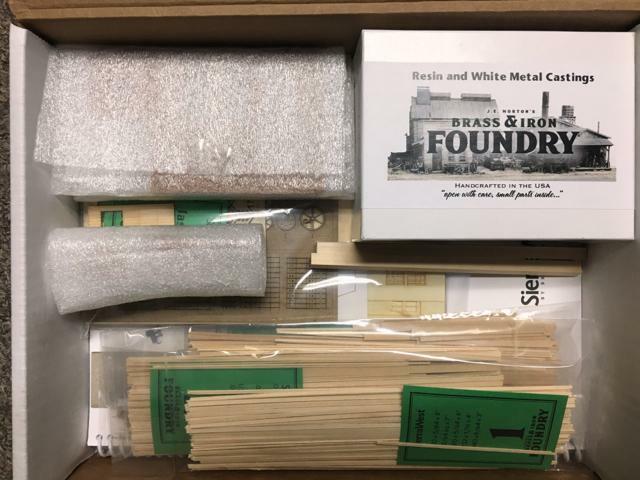 Like other forum members who have already responded, I am excitedly looking forward to your build of the new Brass & Iron Foundry kit. I frequently review your 2017 build of the Blue Sky Company marveling at your creative interpretation of every day examples of detail that escape the eyes of a more casual observers. More specifically I am referring to the bottom corner of the barn structure in that build. rotten damaged boards near the ground with the original framing peeking through. You know the look I am sure." "... and will be one of those nifty details that you have to look for." Well, yes, we do know the look of those "nifty details" and thanks to your modeling efforts, careful explanations and detailed photographs we now have a blue print for and a better chance of captivating those "nifty details" and partially hidden viewing experiences in our own modeling. "Oh... 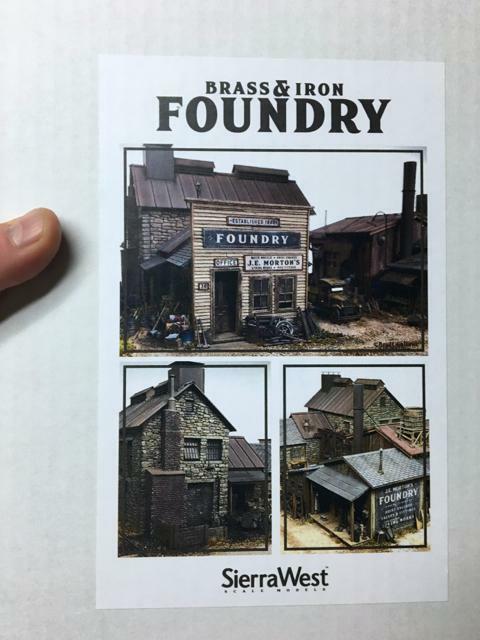 The Brass & Iron Foundry... is going to be one hell of a build!" Thanks Karl and I will call on you frequently for your tutelage and critique. Thanks Brian, glad you'll be along. So glad your here on the forum Robert as we share our work and techniques. You bring such a fresh perepective. You bet Joel and it's nice knowing you're out there following along. Hey Dave, I'm thrilled that you picked up on those subtile details and took the time to comment on them. I really enjoy that kind of detailing and Brett's kits just ooze opportunities for these personal touches. I'm well into making notations and formulating my plan for THE FOUNDRY. Reading and studying the manual and perusal of the web-site pictures of Brett's stellar pilot model all feed my obsession...and yes...one hell of a build!...in my mind at least...the rest is yet to see! I’m definitively going to be following along Ken. Looking forward to you getting your hands dirty with stain!! Dwight, the main thing I have going for me is enthusiasm and a world class craftsman kit sitting in front of me! Following the damp brushing I ran each piece through some fine steel wool to remove a bit of the paint and blend the paint to wood interface giving a nice weathered paint look. I like to perform my final wood detailing as I am applying it to the wall templates. I'll choose my piece of wood and detail it then glue it to the wall and work my way along. This phase of the build is not glamourous and is a bit time consuming but is of utmost importance as it forms the basis and sets the tone for the entire build. In the next step I did a bit of research on what areas of the pattern shop walls were visible either where board ends met the door headers or where the walls contacted the ground. The pattern shop is surrounded with decking of either concrete or wood so there is minimal visible siding to ground contact that is visible. I developed a technique on my last build where wall studs were visible through rotted or damaged siding. Achieving this look is problematic with chip board templates as behind the siding is...well...chip board. This makes a great base for a board-on-board walls but negates the "see through the siding" concept. This is of course not for the faint of heart and not in many modelers play books. I just enjoy detailing the walls so much I can't help myself. Great to see the opening face off and first rushes on goal of the new Brass & Iron Foundry build. This is the kind of detail that gets my attention every time. Glad to have a seat at center ice along with the ability to use the replay button for this build. Wow! 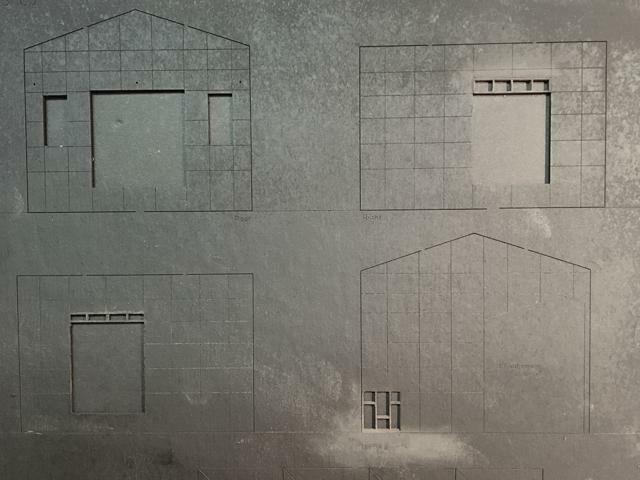 Very creative and extremely simple method of creating the additional level of detail you plan to incorporate into this build. 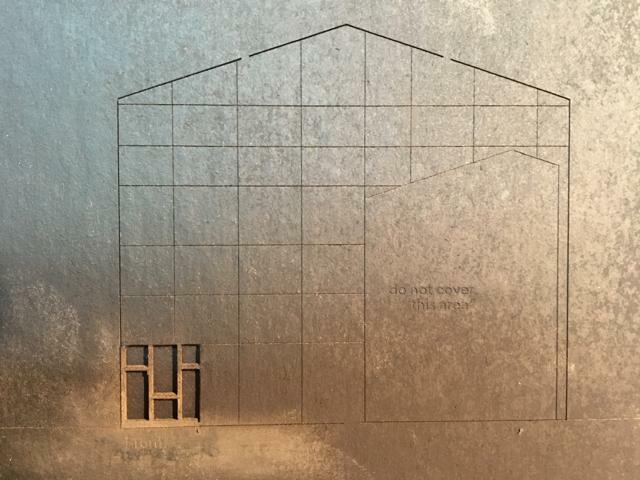 I'm looking forward to see how you will texture and finish the chipboard "framing" and exposed areas of the interior siding given that the rotted/damaged siding will be in an interesting and potentially busy area of final detailing. I also think the location you chose fits perfectly with probable/typical ongoing damage from the day-to-day equipment and material handling activities in that area. The end result of this additional layering is going to enhance a really interesting mini-scene. Appreciate that Brian and nice to see you appreciate this type of "planning ahead" type of detailing. You have a great perspective on what I'm going for here...thanks again. Off to a fine start. I can't wait to see this come together. I know you will bring this one to life! 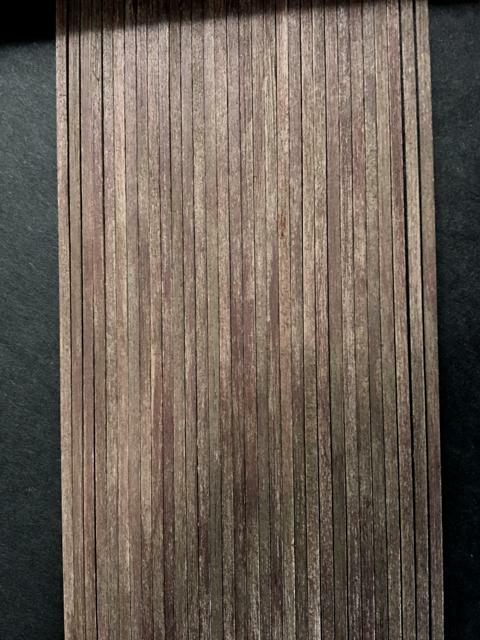 The coloration of the boards is outstanding. I agree the chipboard is awesome so much easier/quicker to put together a model than building individual stud walls to place the boards on. 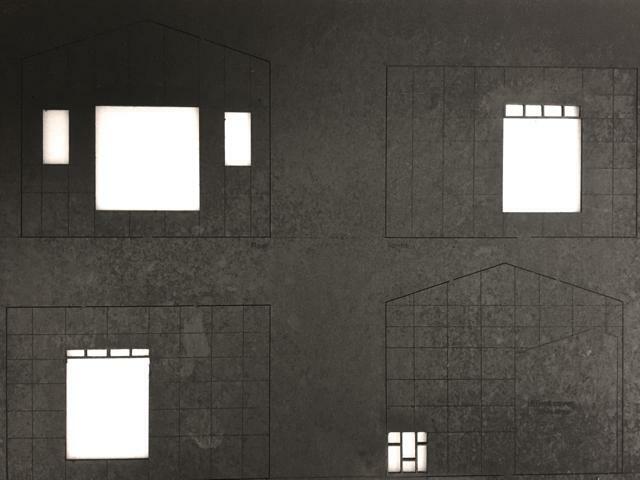 Did you build the exposed stud wall placed in the chipboard or is this from the kit? Do you know are there going to be other reaper/sw paints used for the buildings? If so I am going to have grab a paint set. Any thoughts of integrating this with Oneill's ? I am hear to cheer you on with everyone else! As always looking forward to your next post. Great coloring. Love that little peek of the studs in the chip board great idea. Thanks much Bryan...and me too! Hope so Kevin...great bunch of followers here on the forum which makes the project all that much more enjoyable. Hey Jim...glad to "see" ya! Brett's choice of color for the Pattern Shop walls is great and lends itself well to nice weathering. The studded wall sections are my doing so don't blame Brett for any of that...ha. The SWSM/Reaper paint set is used judiciously throughout the entire build and the colors are referred to by name in the manual...I highly suggest anyone working a SierraWest kit, or modeling in general, purchase this paint set. You won't be sorry. I won't be featuring any integration with O'Neills during this official forum build. With that said, once the build is complete we can dabble in a new thread on combining the two dioramas. Great questions Jim and again, nice hearing from you buddy. Thanks Jerry, and when the walls are complete it will really show the value of this subtile technique. Love the extra detail work Ken! Subtle and well worth the effort. In regards to using my paint set, I provide a list of craft store paint colors in the back of the manual. It is not so much the color choices but the quality of the paint that makes my set a worthwhile purchase. The Reaper High Density colors are really a joy to work with either on wood or castings, and my set provides a focused color palette perfect for my kits.